It's funny how our minds work sometimes. We can create these dramatic, five-act plays of how something we are trying to accomplish could all go horribly wrong. And how tragic and final the result will be. Loss of respect, loss of income, loss of momentum - pick your poison. I'm not trying to belittle the importance of any of our life's projects or goals. And certain failures can indeed have a tremendously negative impact, both for ourselves and others. Still, we often exaggerate the true impact. Not me of course. I've NEVER felt that if I failed at x, it will be the end of the world. And I've NEVER let this this lead to analysis-paralysis or poor decision-making. I was recently watching a documentary that showed during the early days of the Space race and I was shocked to learn that there were a lot, I mean a LOT of failed rocket launches. 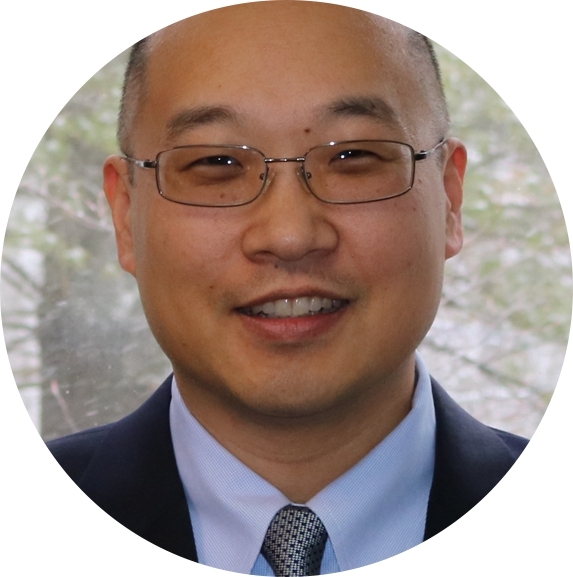 Imagine you are a NASA engineer or project manager of one of those rocket launches. You've worked nights and weekends, made numerous personal sacrifices and given it your all and then some. Now it is all about to payoff in this one, glorious moment. EXCEPT...it's an abject failure. 10, 9, 8...3, 2, 1, liftoff, we have liftoff. Flames, horror, rubble. And there is no question this has been an expensive failure. For example, according to a NASA official, taxpayers lost $110 million when a SpaceX rocket disintegrated shortly after liftoff. So if a rocket scientist can go on after losing $110 million, it puts things in perspective. Do your best, learn from your mistakes, and don't make the boogeyman any scarier than he deserves to be. Let's go ahead and get this out of the way. I'm not a huge fan of video conferencing. In most instances, just getting it to work is like a sadistic game of IT Twister. The scale of the participants makes you feel like you've landed in Lilliput or Brobdingnag. It's less effective than meeting in person and not much better than a conference call. Okay, now that I've gotten that off my chest, I must confess it doesn't have to be that way. Allow me to explain. At certain KPMG locations we have video conferencing rooms that are designed specifically to work with a twin room in another location. I'm not talking about a really nice monitor or multiple speakers. This is video conferencing on steroids. You sit on one side of a long, rectangular table that fits about 8 people. As you look across the table, you see a row of monitors as long as the table, with the life-size images of the people in the other room. If you look diagonally across the table at Jamie, it will appear to Jamie that you are turning your head to look at him/her, just as if you were in a room together. The acoustics are fine-tuned so as close as possible, it seems like you are talking to someone in the same room. As you might imagine, these rooms are in high demand and are often used for executive meetings. Now we come to the part where I almost face-planted my career. I was scheduled to have a meeting with our international lawyers on a sensitive topic so I scheduled a meeting in one of these dedicated video conferencing rooms. I arrived early to prepare and no surprise, there was a previous meeting in session. I waited until a few minutes before our meeting was supposed to start and popped my head in to let the people know that we were waiting. Cue courteous nods and half-smiles - so far so good. Five more minutes passed, then close to ten. I could feel my patience wearing thin. I'm glad I was feeling like my best self that day (must have had a good breakfast) because I resisted the urge to make a big stink about this APPARENT room squatting. After what seemed like an eternity, but in reality was probably no more than ten minutes, the group exits and I come face to face with a Board level muckety-muck. Brief salutations, handshakes, we head into the room and have our meeting with the lawyers and everything is copacetic. One mistake I often catch myself making is being overly confident in my understanding of other people's motivations. For example, if someone is giving me a hard time, it might be squarely based on what I did. However, it could also be based on some baggage from another interaction that didn't go their way. It's important your thinking and any reactions are based on actual knowledge and not assumptions. To me, this is a key to harmonious relationships and without it, it's like trying to open a lock with the wrong key. It just doesn't work. That day I was convinced that the meeting squatters at best had poor time management and at worst, were just self-important and inconsiderate. As it turns out, they were NEITHER. After our meeting concluded, I noticed something odd. The time on the video conferencing screen was different than the time on my watch. In fact, it was about ten minutes SLOWER than the correct time! So anyone using the time on the video screen would assume they had ten more minutes till their meeting ended when in fact they had already ran over. I contacted the IT folks and they fixed this, but I wonder how much frustration and unnecessary angst this simple disconnect had caused. The good news is that this event reinforced for me that you should be careful how you impute the motivation of others. Sometimes you are just projecting your own personality or insecurities. Sometimes people are having a bad, bad day. And sometimes people are just hangry. The EZPZ morale of this story is be slow to judge, quick to eat, and whatever you do, don't trust conference room clocks. Fix an email fiasco BEFORE it happens - using time travel! Picture this. It's late afternoon, you're buried under a mountain of work and you are feeling like Rocky looks in Round 12. You're probably hungry and thirsty, too, but you don't realize it and haven't taken a break in a while. Then, an upsetting email comes in and boom, Krakatoa! How dare he/she? Now you are in full S.W.A.T. mode and you return fire via a less than professional email (e.g., nasty, passive agressive, outright aggressive, or sarastic - pick your poison) that you would not have written under better conditions. As soon as you click "Send," probably not more than 10 seconds later, you regret it. But like that time you said those words you wish you could pull back, it's too late - or is it? I came across a great little set-it-and-forget-it hack on HBR that can gives you Doctor Who-like powers to travel back in time. By setting all your outgoing emails on a 2 minute delay, you can go back and revise or delete any emails after you've pressed "Send," but before they are actually sent. 3. 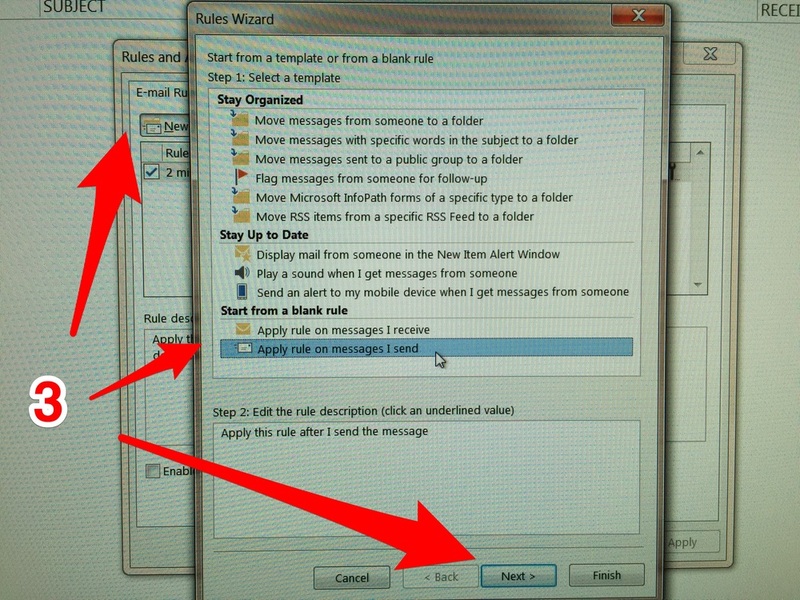 Under “Email Rules” click “New Rule” and under “Start from a blank rule” click on “Apply rule on messages I send.” Click “Next,” (you don’t need to choose any conditions), and click “Next” again. 4. Check “Defer delivery by _ minutes” and fill in the blank. Now test this by sending yourself an email. You should see it hanging out in your Outbox for 2 minutes before it is sent. Now you can go into your Outbox and delete or revise a nuclear email. Other useful scenarios include adding a person or attachment you forgot or when you realize you didn't read all the emails in the chain. The well-written HBR article on this by Katie Smith Milway (@KatieSMilway) has additional information for different versions of Outlook or for Gmail users. Check it out!